Treat your friend, colleague or loved one to some lovely knitwear with a digital gift card. 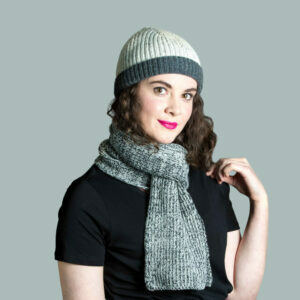 They can select their favourite hat, scarf or headband from our full collection and have it sent straight to their door. Select the value of the gift card from our drop down menu and click to add it to your cart. Once you’ve finished shopping, go to the checkout page. You’ll then see an option to either send the ‘coupon’ to you or directly to the recipient. If you send it to the recipient you can add their email and a message at this point. Once payment is confirmed the digital gift card will be emailed and its ready to use on our website. We’ve used a deep shade of Bordeaux blended with black to create a mottled effect in the scarf from this set. To show off the structured fit, the two colours are separated in our fisherman style beanie hat. Made from soft lambswool, this set will work well with your wardrobe as it can be paired easily with other colours. This lambswool is soft to touch and light weight, providing a nice layer of insulation on fresher days. The Bowmont Twisted Band and infinity scarf makes a beautiful and versatile knitted set. Worn together or on their own, they will add a welcome layer of warmth to your outfit. 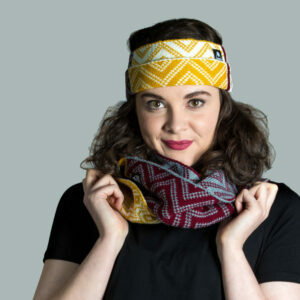 The twist headband can also be worn around the neck for days when you want a little less bulk in your knitwear. Both products are knit with a double layer, so you get a great mix of colour with additional comfort, win! We've made a nice cosy set from the Bowmont hat with matching knitted band. The natural colours of forest green with burgundy, navy and charcoal work really well with other colours making this a wardrobe staple. The knitted band can be worn round your neck or around your ears, depending on how much knitwear you need that day! 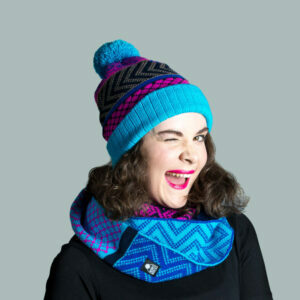 We’ve created this vibrant set from the Wonky disco range by pairing the infinity scarf with the slouch style hat. We love the combination of turquoise with fuchsia, as it's so striking and adds a burst of colour to your wardrobe. This scarf can be worn long to hang down or looped around your head twice to create a soft and cosy layer. This stunning set screams autumnal cosy comfort. 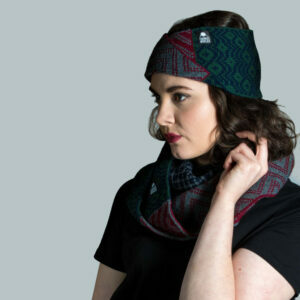 The matching headband and infinity scarf will add warmth to you and your outfit with it's folding layers of knitwear. 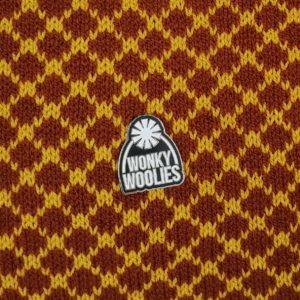 We've combined mustard with burgundy, cream and soft grey in our classic Wonky design. Each piece is knit with a double layer so you get a variation in the colours shown as well as a really cosy set of products. The rambler bobble hat is appropriately named as it's perfect for outdoor life, being made from 100% pure Shetland wool. This type of wool is particularly good for keeping you warm against the elements with its wind stopping qualities. 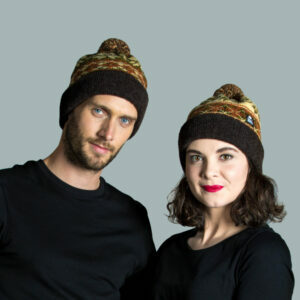 We’ve sourced a unique twisted wool for this pair of knitted hats which blend gold and black together to add a layer of depth. This type of yarn is difficult to source making this set a limited-edition colourway. We love the warmth of the burnt orange hue against the deep tone of brown and soft buttermilk. We've mixed all of the colours from the hat in the soft felted bobble, which we sew on by hand to make sure they stay put! 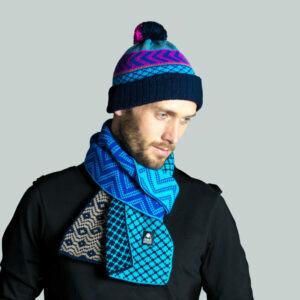 We've paired this bobble hat and scarf together from the Wonky Disco range to create a vibrant set. 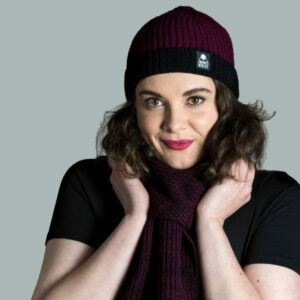 The short fitting hat includes a smaller pompom made from navy and pink yarn. Our signature Wonky design is a stack of three patterned sections, including a stripe of chevrons. 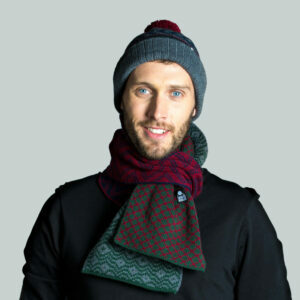 The matching scarf can be worn in a variety of style and is knit in a double layer for extra comfort. 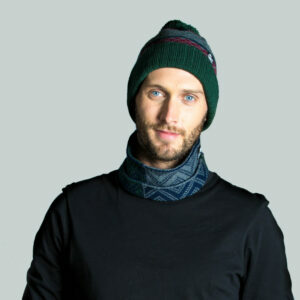 Our new style of wonky hat is shorter in length which fits snug on your head. We've paired it here with the long scarf from the Bowmont collection. This range combines charcoal, forest green, burgundy and navy in a rich tone. The long length scarf can be worn in a variety of styles to show off the multitude of patterns and colours. This set is made from soft acrylic yarn which is warm and durable.